Joe wood is the owner and founder of Parasol Tattoo Company. 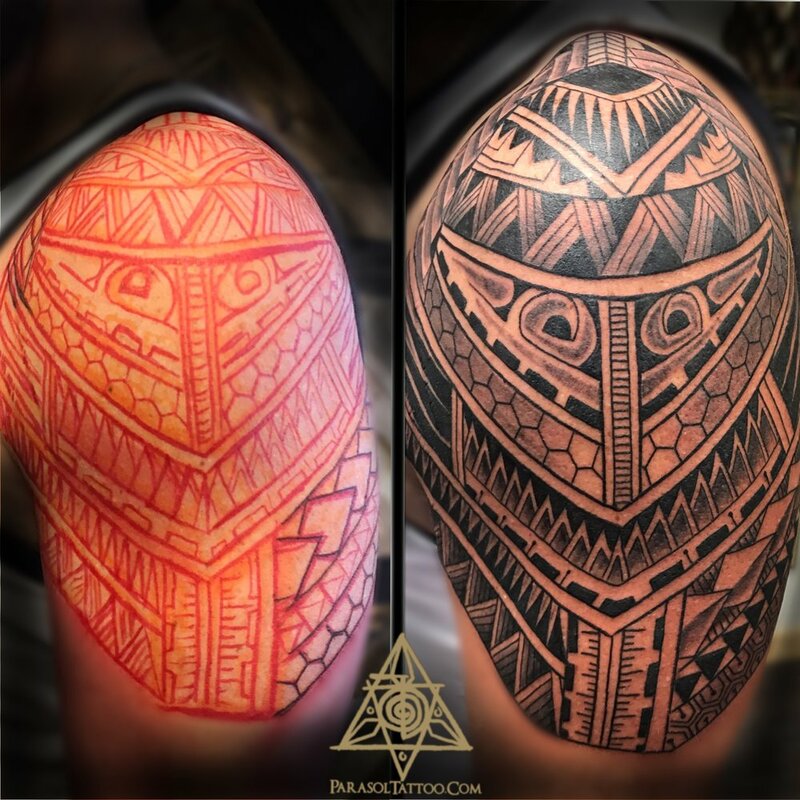 He specializes in custom Polynesian and geometric design work as well as photorealistic black and grey and bold color Japanese. Abbey Saunders was born and raised near Saratoga Springs, and still calls the area home. Tattooing since 2014, she specializes in custom blackwork and colorful botanical tattoos. Joslin specializes in geometry and patterns, nature, dotwork, blackwork and American traditional. Parasol Tattoo Company creates an environment that inspires artists and clients alike. We work with and are inspired by artists from all across the globe, to not only be better artists’ but better people. We hold ourselves to the absolute highest standards in cleanliness and artistic skill. We provide our guests and community with an environment that is not only clean but safe and inviting to all. We strive to give our guests the respect and attention that each and everyone of them deserve as individuals and will constantly work to ensure the artwork you choose to make permanent is unique and held to our high standard. We also realize without our community we would be nothing, this is why we work with numerous charities and local businesses. Helping others in need is extremely important to every one of us at Parasol Tattoo Company. We hope to inspire others and set an example thru charity, hard work and kindness. 1) In 1-2 hours after receiving your tattoo, thoroughly wash hands then remove the bandage covering the tattoo. DO NOT BANDAGE THE TATTOO AGAIN. 2) Using clean hands, gently wash the tattoo with a mild, liquid, unscented antibacterial soap such as Dial gold. Do Not use washcloths, or sponges or loofahs on your new tattoo, as they can harbor bacteria and be to abrasive on your tattoo. When your finished cleaning your tattoo, pat the area dry with a paper towel or let air dry for up to 30 minutes. 3) Apply a thin layer or ointment such as Hustle butter, Redemption ointment or Aquaphor after each cleaning. 4) Repeat steps 2-4 minimum four times a day. The cleaner you keep your tattoo the better it will heal. Oxygen is essential to the healing process, let your tattoo breath without ointment for 30-60 minutes at least twice a day. If you are using Redemption ointment or Hustle butter - continue using that and following the above steps until the tattoo is fully healed. If you are using Aquaphor - stop using ointment after four days and switch to non-scented hand lotion. Such as Aveeno or Eucerin. Continue washing and moisturizing your tattoo for one more week or until it no longer looks dry on its own. AVOID direct contact of your new tattoo with pets or unclean surfaces such as, but not limited to gym equipment, raw foods, hospital surfaces, dirty work conditions such as garages or construction sites. - Your tattoo may feel like a sunburn for the first day or two. Your tattoo may also peel like a sunburn, this is normal. - For the first night after your tattoo we recommend putting clean dark colored sheets on your bed, as the tattoo may bleed and stain lighter colored sheets. - After about a week, your tattoo will start to itch. This is a good thing, it means it’s healing. However, it will be annoying, the best thing you can do is wash it and re-moisturize the tattoo. This will help tremendously with the itching as will lightly patting the tattoo with your hand. Avoid scratching your tattoo. - Once your tattoo is healed, applying sunblock over the tattoo when it’s exposed to the sun will greatly increase the life and vibrancy of your tattoo. The better you take care of your tattoo, the better the tattoo will look. Following these aftercare instructions will help insure the longevity and quality of your tattoo and result in fewer touch ups.